Three dozen countries, including Canada and all 28 EU members, called on Saudi Arabia on Thursday to release 10 activists and co-operate with a UN-led investigation into the murder of journalist Jamal Khashoggi at its Istanbul Consulate. The joint statement, also backed by Australia but not the United States, was read out by Harald Aspelund, Iceland’s ambassador to the UN in Geneva. There was no immediate Saudi reaction. “We are particularly concerned about the use of the counterterrorism law and other national security provisions against individuals peacefully exercising their rights and freedoms,” Aspelund said, reading the text. Badawi is the sister of blogger Raif Badawi, who has been in a Saudi jail since 2012. Raif’s wife and their three children became Canadian citizens last summer. Activists allege jailed women activists, including those who campaigned for the right to drive, have been subjected to electric shocks, flogging, sexual assault and other forms of torture. The EU and other sponsoring countries said they “condemn in the strongest possible terms” the killing of Khashoggi, noting Saudi Arabia has confirmed it took place at its Istanbul Consulate on Oct. 2. “Investigations into the killing must be independent, impartial and transparent,” it added, specifically calling for co-operation with a probe led by Agnes Callamard, the UN special rapporteur on extrajudicial executions. Turkey, non-EU Switzerland and Israel weren’t among the signers. 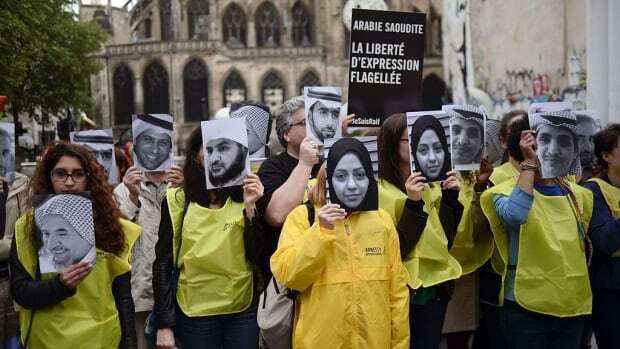 UN human rights chief Michelle Bachelet called on Saudi Arabia on Wednesday to release women activists allegedly tortured in detention after authorities accused them of harming the country’s interests. “These women human rights defenders are detained only because they fought for their right to exist equally as men in their country,” Salma El Hosseiny of the International Service for Human Rights said in a statement on Thursday.